Want to see places with less travel expenses? Then, watch out for Philippine Airlines Ultimate Sale happening soon! What are the promo fares of Philippine Airlines which will be soon up for booking? With PAL promo tickets as low as P199 one-way base fare for domestic travel, you can fly to your desired destination at lesser costs. Traveling to international destinations? Why not book the incoming PAL international sale ticket as low as USD79 base fare round trip promo? 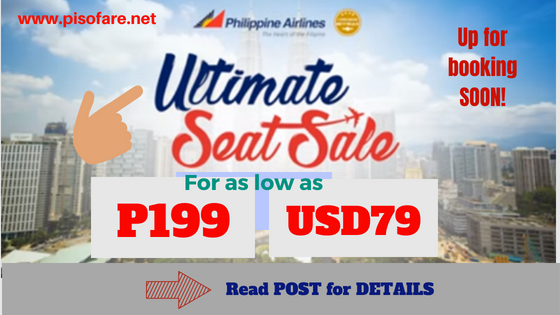 Booking Period of Philippine Airlines ultimate seat sale: August 27- September 2, 2018. Please read promo update: Philippine Airlines Ultimate Seat Sale ticket rates and destinations. As what was published, PAL sale tickets for local and foreign trips are ONLY BASE FARES, thus, the advertised ticket prices will still increase due to additional fees: taxes, admin fees, surcharges, airport terminal fees. Previous seat sale of PAL for local trips include only checked baggage allowance for flights to and from Manila. Flights from other PAL hubs and inter-domestic routes do not have free checked baggage. As for international destinations, free baggage allowance depends on the foreign flight route. For international trips, please be reminded that you need to secure Visa and other documents required by your destination country. Also, the Philippine Travel Tax must be paid prior to departure. This is applicable to Philippine passport holders, foreigners holding a Philippine resident visa, and foreign tourists or expatriates who have stayed in the Philippines for more than one year. So, as early as now, prepare your travel itinerary, passenger details and contact info. Philippine Airlines promos are on limited slots and subject to seat availability. If you have a credit card or debit card, prepare these. Online payment options are best to secure the Philippine Airlines promo ticket you want to book. Don’t forget that booking for the Philippine Airlines Ultimate Sale will start August 27, 2018. For more Philippine Airlines seat sale 2018 to 2019, Cebu Pacific and Air Asia promos, Like us in Facebook: PISO FARE TICKET!!! Watch our for updates on this awesome sale!